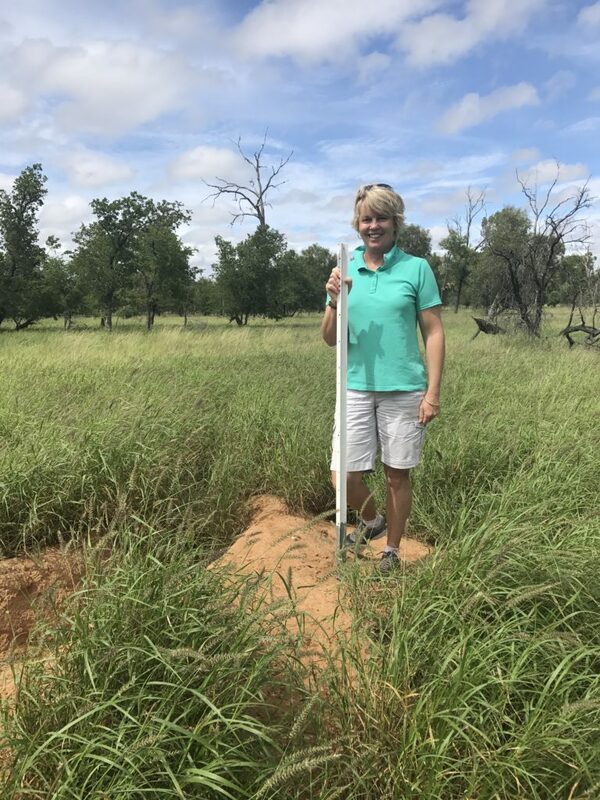 In this special blog post from the field, one of our Wombat Foundation directors Leanne Brosnan tells us how her dream came true recently when she visited the Northern Hairy Nosed Wombats at Epping Forest National Park – and discovered new wombat burrows for good measure! Since 1999, when I first met Dr Alan Horsup I have dreamt of seeing a Northern Hairy Nosed Wombat. Nearly 20 years later that moment finally arrived, when I had the opportunity to travel to Epping Forest National Park with Alan and fellow wombat enthusiast and friend Cheryl, and a wombat mascot by the name of Rocky. The journey out to site from Rockhampton took most of the day, but on arrival we quickly settled in to the very comfortable accommodation at the Camp, which includes great kitchen and bathroom facilities and air conditioned bedrooms - all in dongas (transportable buildings). We also met the amazing Michelle and Mal Barker (The MnMs) who were caretaking at the Park (more on them later). On the first night Alan took us for a spotlighting walk to burrows close to Camp. We saw some fresh tracks and scats, got to smell the distinctive aroma of a wombat and heard the thump of one disappear down its burrow at our approach. Alan showed us the amazing kookaburra tree, with 5 Kookaburras all in a row on a tiny branch. But alas there were no Wombat sightings: even the very reliable "Dunny Wombat" was nowhere to be seen, so we retired to the cool of our rooms for a good night's sleep. The next morning we were up early and in the work ute to head off for a tour of the park. Recent rain had meant the Park was lovely and green, with an abundance of grass and beautiful wild flowers. The false sandalwoods were in bloom, the wild hibiscus were in flower, even some of the Gilgai holes still held water. We spotted a tree snake and a goanna, double bar and zebra finches, hawks and cockatiels to name a few. Alan explained how the Park had evolved since its inception in 1971, how the dingo fence was built and water tanks were added to supply supplementary water stations for the wombats. We were lucky to have cool, cloudy conditions so after lunch Cheryl, Rocky and I went for a walk to explore some more burrows located at the Camp end of the Park. Some small, some large, some collapsed with long runways and many entrances, others with single entrances, active burrows with freshly dug sand and scats and long disused ones with grass growing in them. After dinner we set off again, this time in the work ute, with Alan determined for us to see a Wombat. Finally, just after 9:00pm, with the temperature at a perfect 24 degrees we finally saw our first Wombat. A juvenile, he stood still for a moment in the headlights, before disappearing into the night. This sighting was followed in fairly quick succession by another two, all following roughly the same pattern - a wombat rambling up one of the park roads, a moment of indecision as the wombat processes what's happening and then the flash of a disappearing rump into the long grass. We returned to camp and were getting ready for bed when Alan came and told us that the "Dunny Wombat" was out. This large female has set up home close to the old "Long Drop" toilet next to camp. She has had four joeys in recent years and has become quite used to living in close proximity to humans. We were thrilled to watch her in action close to her burrow, unfortunately she was startled by a gust of wind banging a piece of tin nearby and she retreated suddenly. Cheryl and I snuck closer to see her peering up at us from the safety of her burrow, so amazing. The next day we were back out in the Park alongside Mal and Michelle as they swept feeding stations, checked cameras and looked for any sign of predator footprints. Alan showed us several landmarks in the Park that were established by former caretakers (Richard's Tree and Ken and Naomi Henry's Cuppatea spot): they show the special contribution of caretakers to the Park over the years. A wonderful example is Mal and Michelle. They have been coming to Epping since 2008. They clearly treasure this amazing experience as they have returned so many times, however Michelle is quick to point out that it is definitely not for the faint hearted. In their time at Epping they have been flooded in, bogged and faced swarms of mozzies and flies and of course the ever present ticks. However, it has been an incredible experience that keeps them coming back. To see the amazing wombats, contribute to the story of Epping and make a real difference to the survival of a species - an opportunity few people on Earth will ever have. And did I mention one of the best parts of the trip? Finding 3 new burrows! On our final day we marked their location with the standard white post and numbering system and Alan recorded their GPS coordinates. Such an encouraging sign that the Wombats at Epping are continuing to thrive and expand their burrowing locations. As well as the wombats and the beautiful landscape, I’ll remember our time at Epping as great food, a few glasses of red and some lively song, led by Alan on his guitar. While it is clear that many challenges still lie ahead for the Northern Hairy Nosed Wombat – especially the need to find a third site, Alan’s passion and expertise are very reassuring and it was such a privilege to experience this unique place and see these amazing creatures under the guidance of such an extraordinary man. You can register your interest in becoming a volunteer caretaker here. 2018 Hairy Nosed Day is our annual awareness and donation day, follow us on Facebook to keep up to date with activities and ways you can fundraise for our Foundation.